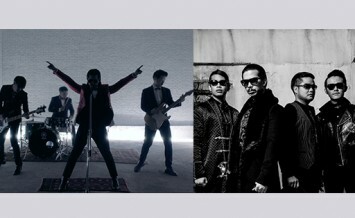 "“Dai Way La” (Thai version) - or “And We Go” (English version) - from their Spin The World Thailand Edition EP"
Thailand’s leading rock band, Slot Machine, are breaking away from the traditional way of writing songs, trying something new with their latest single “Dai Way La” (Thai version) - or “And We Go” (English version) - from their Spin The World Thailand Edition EP. With the aim of creating a song with multiple dimensions, the band took their favourite parts from the demos of three separate songs and combined them, resulting in one outstanding new song. The process of deciding which parts to use was the most difficult. Synthesizers were also included to add a further element adding to the song’s distinctive charm. The band’s vocalist, Foet, and producer, Steve Lillywhite, co-wrote the hook of the English version: “And we go, and we go, and we go, la la la la la la ah”. The short percussive words were so powerful that Po Posayanukul, who wrote the Thai lyrics decided to keep them, hoping the rousing hook will lift and inspire listeners. All these elements are what make “Dai Way La” special and Slot Machine hopes fans will be thrilled with the new song. The song is also available at Apple Music, JOOX, and TrueMusic. Music video is available on YouTube and LINE TV. Slot Machine’s songs can be downloaded at iTunes Store and Qikplay.